As another BUSY seal pupping season has come to an end, the fine folks here at the New England Aquarium’s Department of Rescue and Rehabilitation thought it necessary to touch on a few points to bring the season to pleasant closure. First we will review some basic facts about some of our resident marine mammals, then we’ll touch on some key points to take away from this busy season we’ve all had. 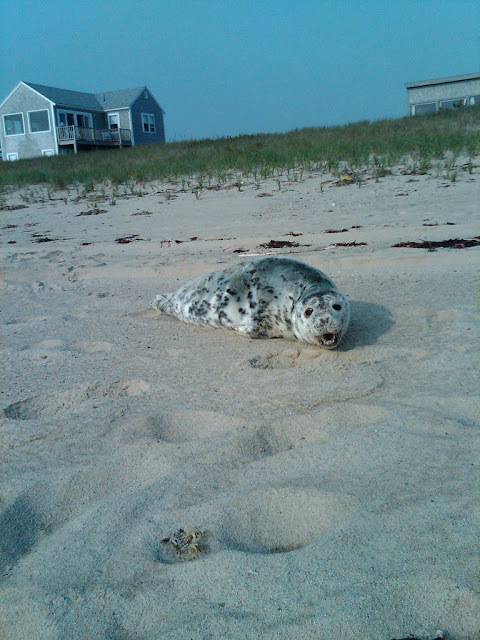 First things first, what types of seals will New Englanders, and tourists, most commonly see during these summer months? 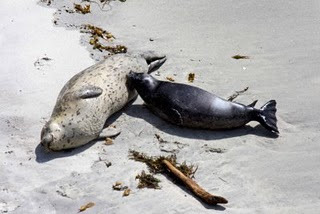 Even though there is a strong bond between mother and pup, harbor seals for the most part do not show affinity to be in close contact with other harbor seals. However, during molting season which is between spring and fall, they are often found congregating together on sandy and rocky areas in addition to various kinds of intertidal zones. They can be found sleeping, scratching, lounging, as well as scanning the area for potential threats of predators. It is common and natural to find a seal pup alone out of the water hauled up on shore. It is here that the young pup, usually still nursing, rests as it waits patiently for its mother to return from feeding. Harbor seals will nurse their pups for roughly four weeks, and after that are abruptly weaned from their mothers. At this point, the seals are left to fend for themselves. This is a very stressful time for these young seals, and why it is especially important to allow them to rest undisturbed! 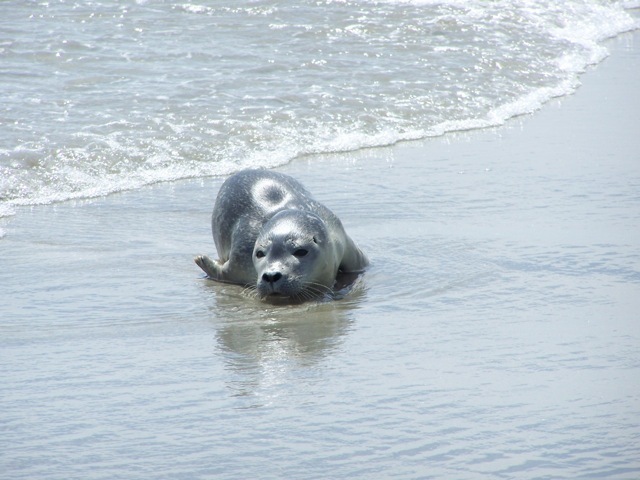 Approaching a seal, regardless of age, places the animal and the approaching person in danger. Stress to these creatures puts them at greater risk of prolonged illness and injury. If you should happen to see a seal resting on shore, it is important to stay at least 150 feet away. The Marine Mammal Protection Act of 1972 states that anyone is in violation of this Act if their presence changes the behavior in any way of a marine mammal. We therefore recommend people to stay at least 150 feet away, and depending on the behavior, even further. The Aquarium's Rescue and Rehabilitation Dept. sign that we use in the field. The strandings of whales, porpoises and dolphins should not be confused with seals coming on shore. The response methods used for different marine mammals varies according with species. For instance, responding to a stranded dolphin or other cetacean, which should never come ashore, will be very different than our response to a seal, which commonly rest on shore. This young harbor seal, seen above, is resting on a rocky shore. It does not appear to be in need of assistance. The best approach is to monitor the seal at a safe distance. There is no need to intervene, since that will cause unneeded stress. The above picture shows beach goers sitting and congregating TOO CLOSE to a resting seal pup. What these children and most people do not understand is that their presence puts this pup in danger. If this pup were still nursing, mom would not approach if people or other predators were present. Mom will often abandon her young when danger is present and if that happens, it will lead to the pup not getting the nourishment needed and possibly cause its demise. The physical presence of humans, any physical contact or placing yourself between the animal and its perceived escape route back to the water are all very stressful situations for these animals. If there are pets present, that too will contribute to increasing the seals stress and put its survival at risk. 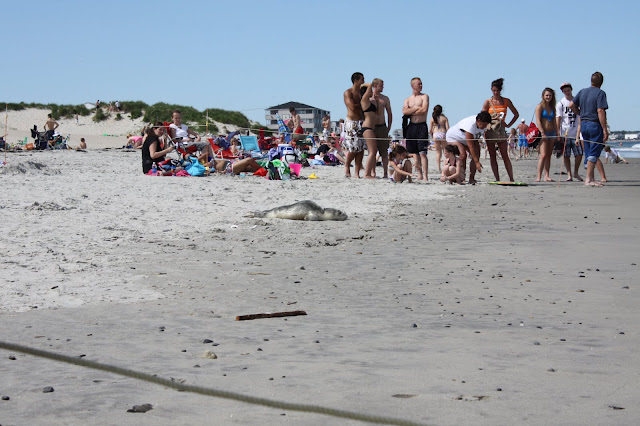 For the safety of beach goers and their pets, it's important not to come in contact with these animals. Not only is it illegal to make physical contact, but seals are also capable of transmitting disease to other mammals they come in contact with. This includes dogs as well as people! 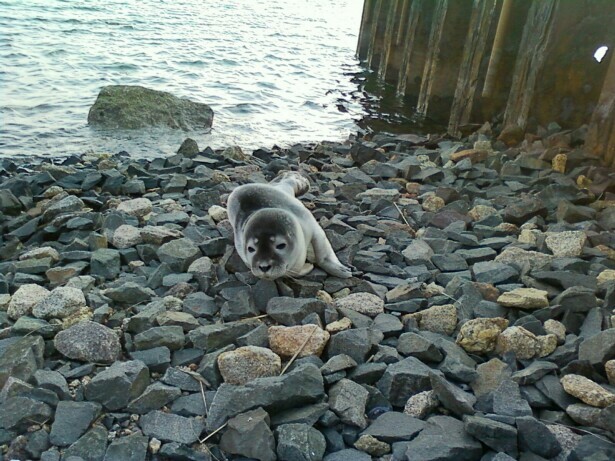 The harbor seal pictured above is aware of the person taking its picture. The photographer is quite a distance from the seal, and the seal appears to be relaxed based on the “banana posture” of its body. This photographer is TOO CLOSE to this young gray seal. The footprints surrounding this animal are an indication that people were interacting with this animal. Gray seals are known to act aggressively, and they will often growl and vocalize when they feel threatened, as shown in the picture above. NOW FOR A FEW TAKE HOME MESSAGES! • Seals rest on shore. This is perfectly normal behavior for all seals, young and old. Wouldn’t you be tired too if you were swimming in the ocean all day? • While they are resting, they need to be left alone! Do not try to feed, touch, or pose with these animals for pictures. Remember, harassment is anything that changes the natural behavior of the seal. • If a seal truly is injured, don’t touch it or try to help it! Call the Marine Animal Hotline immediately. • Keep the WILD in WILDlife. Enjoy the presence of these native animals from a distance. This blog was created by our wonderful Wednesday volunteers, Diane and Deidre. Thanks to them, and to all the rest of the volunteers for their hard work with the Rescue Department! Every time I go diving those seals come up to me. I tell them "back off buddy your breaking the MMPA" but they don't care, they just want their belly rubbed. SO, how many of the save the seals people have actually swam with the seals? Track and Adopt a Green Sea Turtle!